Canadian Conservatives are now conflating BDS campaign with hate speech. What the country really needs is to recognize the dangers of stifling speech. 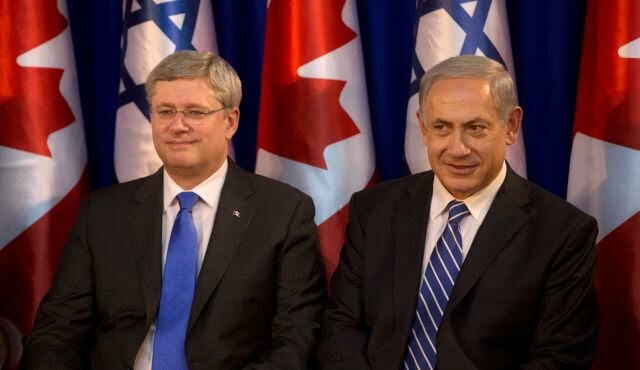 While Canadian Prime Minister Stephen Harper appears to be auditioning for a lead role in a political bromance with Benjamin Netanyahu in some epic right-wing production, he may well have overplayed his part with his latest move. As the Canadian Senate debates Bill C-51, the Conservative government’s “anti-terror” bill that would give Canada’s spy agency sweeping new powers and has alarmed civil libertarians, environmentalists, First Nations activists and Muslim Canadians, another frightening aspect of the Harper government’s agenda has been revealed. Following the lead of Israel, where a law criminalizing participation or encouragement of BDS was recently upheld by the High Court of Justice, in a majority ruling equating boycotts with “political terror,” the Canadian Conservatives are now conflating the advocacy of the boycott, divestment and sanctions campaign with hate speech. The Canadian government changed the definition of hate speech in the criminal code last year, adding the criterion of "national origin" to race and religion, and the country's foreign affairs minister at the time, John Baird, signed a “memorandum of understanding” with Israel in January of this year vowing to fight BDS. But it was Canadian Public Safety Minister Steven Blaney who made the link explicit. In a speech at the United Nations a few days after the memorandum was signed, Canada's CBC News reported, Blaney linked BDS with anti-Semitic hate speech and even the attack on Charlie Hebdo – which the Conservatives claimed was an attack against free speech. The Canadian government, added Blaney, now has “zero tolerance” for BDS. But Canadian leaders may well have been tripped up by their own rhetoric – you can’t advocate free speech and criminalize dissent at the same time. Ironically, it was a report by the beleaguered CBC – the national broadcaster whose budget has been rather savagely slashed since the Conservatives came to power in 2006 and that has often been accused of toeing the Harper/Netanyahu line – that triggered an outpouring of national outrage from a wide range of Canadian society. Micheal Vonn, a lawyer for the British Columbia Civil Liberties Association, told the CBC that the expanded definition of hate crime is clearly "a tool to go after critics of Israel." Like Netanyahu, he knows how to play to his base, and manages to stay in power despite widespread dislike. Whether his latest move has gone too far for Canadian voters remains to be seen, although he's not alone in this; even the rival Liberals and NDP have officially expressed opposition to BDS. While a Conservative predecessor of Harper’s, former Prime Minister Brian Mulroney, once threatened South Africa with sanctions in an apartheid-era speech to the United Nations, Canada was one of the Commonwealth’s softer opponents of the South African regime. (At the time, Harper was a leading member of the Reform Party, which included white supremacist groups and had several prominent pro-apartheid members.) But even then, there was never such an overt criminalization of boycott advocacy. In the United States, where hate speech is often considered one form of free speech, it was Americans advocating against sanctions who were prosecuted for bringing medical supplies to beleaguered Baghdad during the 12-year embargo. One would hope that Canada, simultaneously the birthplace of the Israeli Apartheid Week movement and Israel's greatest friend, according to Harper, will not ultimately see a law implemented that criminalizes elderly Quakers for bearing BDS placards at peaceful rallies. The best possible outcome of Harper’s latest maneuver would be a heightened national dialogue about the Middle East and a heightened awareness of the dangers of criminalizing dissent. Canadian journalist Hadani Ditmars is the author of "Dancing in the No-Fly Zone: a Woman's Journey Through Iraq" and a past editor at New Internationalist. She has been reporting from the Middle East for two decades.